I am a fantasy & sci-fi writer as well as a playwright, living in Austin TX. I'm kind of fascinated by TED talks, as they are these esoteric nuggets of wisdom or (more often than not) psuedo-wisdom boiled down to eight to twelve minutes. But I would love to get that call. Though I was never quite sure what I would talk about. Until a bit this weekend put things into focus. See, in going to cons, I interact with prospective and aspiring writers. I think that's important, I'm all for it. Indeed, if you see me at a con and want to ask me questions about process or business of writing, I'm all for it. Buy me a drink* and let's do it. But I've noticed a recurring trend that I would talk about, if given the chance. It strikes me there are a lot of people out there who want to be a writer. More specifically, they want to have written a book and have it out there. They aren't interested in the process of writing or what it takes to sit down and actually write a book.They just want the book to already exist. And, in a way, I get that. I get that there's a hurdle one has to overcome, where you are the entirety of a fandom of a property that only exists in your head-- you just want this thing to exist so other people can love it as much as you do. But before a thing can get to that point you have to sit in the chair** and do the work. Not just the writing, but the process of building the world***, defining the characters, and the nuts and bolts of storytelling. Some people don't want to do the work, because they don't realize the work is part of the process. The process is invisible to the consumer. They just see the finished thing and say, "I want to have one of those!" And that's a good place to start. But you have to realize it's not a snap-your-fingers-now-you've-won-the-lottery thing. It's a career of continuing to work. Speaking of, I've got a manuscript to edit and another to finish. So I'm off to the word mines. *- The drink is entirely optional. You don't have to ply me with liquor to get advice. But I certainly wouldn't mind it. **- Or stand at your standing desk, walk on your treamill desk, etc. ***- This is a thing you have to do even if your writing a book that's, say Chicago-but-with-vampires. You might know Chicago perfectly because you've lived there your whole life, but the rules of the world of your book needs to be more than "and there are vampires here". The inherent flaws of lazy worldbuilding will show through. 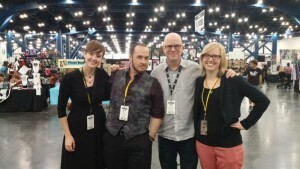 Still well into ComicPalooza, in which I'm having a lovely time, but saints, is this thing huge. It is kind of a trade off for a writer to come to something like this. I mean, when you go to a lit-focused con, you have a smaller crowd, but it's a crowd who are definitely very interested in reading books. Here, you've got a huge crowd, but they have such a wide variety of interest, so many aren't necessarily keyed in to reading fantasy books. Still, it's been interesting. Got to see some old friends, meet some new writerly people. Here I am with Carrie Patel, D.L. Young and Bonnie Jo Shufflebeam. Cons are a double edged sword, though, because whenever I go, productivity drops through the floor. I'm a bit behind where I want to be with Alchemy of Chaos and An Import of Intrigue. Not in bad shape, but I've not been as productive as I wanted to be these past few days. On the other hand, Thorn of Dentonhill continues to do well. 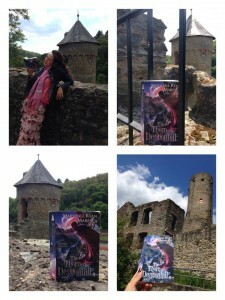 Musician and actress Patricia Vonne (Sin City fans might recognize her as Zorro Girl) took it with her on tour in Europe, so Thorn got to visit German castles. So, go buy some of Patricia's albums. She's awesome. I have two more panels today before I can go home and fall down. Wish me luckk. I figured it's time to answer a few of the questions that I haven't been getting. How do you pronounce Veranix's name? "Veranix" has the same vowel sounds and syllabic stresses as "therapist". Don't read too much into that. What about Minox and Satrine? "Minox" is with a long "i" and short "o". Mine-Ox. Like an ox who works in mines. Satrine's "a" is a short "uh", and the "i" is a long "ee". Like Katrina with an S and no "a" at the end. I dug deep into Googling you, and found some Quantum Leap fanfic. Is there a question here? So you don't deny it? We all do foolish, regrettable things in college. This was the early nineties. We didn't know the internet was going to catalog everything back then. Semi-spoiler for THORN-- You know that [Astronomical Event] is physically impossible, right? I do! And that is a point that gets directly addressed in Alchemy of Chaos. What hints can you give us about Alchemy? We're going to be getting deeper into street politics of the Aventil gangs. If I were to buy you a drink at a con to pick your brain for publishing advice, what should I buy you? Whiskey sour, or if you're really feeling like getting the goods, 18-year-old Glenlivet on the rocks. And what cons will you be at? I've just updated my Appearances page! 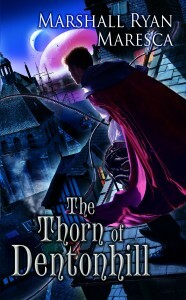 I'd like to thank everyone so far who bought, read and enjoyed The Thorn of Dentonhill. Your support so far has meant the world to me, and I hope I've engaged you enough to keep you along for the ride through A Murder of Mages, The Alchemy of Chaos, An Import of Intrigue and beyond. And, yes, I've got a whole lot of beyond planned. To date, I've largely avoided any sort of serious social media gaffe, on either side of the equation. But sooner or later, as I put more books out, something is going to happen. Social Media is a minefield, after all, and if you aren't the one navigating it, then you're going to be the mine. Like I said, to date, I've not had any real gaffe, at least as far as I know. There may be some people out there who see my name or that I responded to their tweet and think, "Oh, geez, this guy." But if there are, I'm not aware of it. I've yet to have someone gun for me, unless you count a three-star review as "gunning for me". Which I don't. But like I said, it'll likely happen, sooner or later. And when it does, I'll handle it best I can. I mean, I've been on the internet for over 20 years now, and I was in a few flame wars back in the day when I was younger and hotheaded, but nowadays? I'm more than content to let someone be wrong on the internet and be on my own way. I've got books to write, after all. Next weekend I'll be at ComicPalooza in Houston! Come say hello! There really are two things you need to sell as a writer: the competence to write something well, and the confidence to send it out into the world. The challenge is, of course, having sufficient amounts of both is rarer than people think. Now, how do you know if you are a competent writer? Frankly, the best sign is that someone is willing to invest in it. A publisher or agent getting behind it, or people willing to buy off a sample. Of course, to put your work out there so that a publisher, agent or reader can have the opportunity to invest in it, you've got to have the confidence in yourself to send it out. I've seen plenty of people who are constantly re-writing and workshopping a work into oblivion, swearing that it'll be ready to be shopped "soon". And the work is very good, and they should be querying. But they aren't. High competence, low confidence. And, on the flip side, I've seen several things which have no business being put out there, but people are trying desperately to have it sell. And I get the sense that they honestly think it's really incredible work. Maybe it actually is, and I'm the one with Dunning-Kruger. Maybe I don't know what is and isn't any good. In the meantime, I'm confident enough in my own work to keep putting it out there, and the results are showing me that I'm fairly competent at what I'm doing. But there's always room for improvement. *- Alternative: Work that gets you praised in high school is probably sloppy and amateurish in the adult world. It still strikes me as odd how many "friends" I have that I've never met. This is despite having lived through various iterations of on-line interactivity, but we've reached a point culturally where saying "that's an internet friend" is something you can say without people thinking it's completely weird. And that is completely weird. But it's a weird I love living in. It is also part of what the writing community-- in being a community-- is built on. I've maintained email and social media connections with writers that I've never met or only met briefly. I've never met any of the Word Whores, despite group blogging with them. My joining up with them came about entire though on-line connection. This isn't really a new thing, though, just because we live in the modern, internet age. Genre writers in the past would do the same thing, just the old-fashioned way. Hell, Ursula LeGuin had a long and involved relationship of correspondence with James Tiptree, Jr., without meeting face-to-face and finding out Tiptree was actually Alice Sheldon. Of course, like with all social media elements of the writing business, you have to ask yourself, how much do I want to deal with it? Do I have to be on Facebook and Twitter and Pinterest and form bonds with other genre authors and spend half my day doing that stuff? No, not at all. But I'd be lying if I said it wasn't helpful. That interconnectivity, that mutual recognition, it has a rising tide effect. If you wonder how one book or another becomes the "buzz book", a lot of that comes from other authors. So, no, you don't have to do it, but it can be a good thing. Plus, the writing community-- especially the genre writing community-- are cool people. Reach out to them. They will probably reach right back. 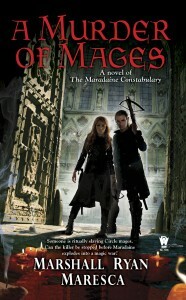 I've been talking in vague terms about the sequels to The Thorn of Dentonhill and A Murder of Mages. But now, finally, I can say that DAW will be publishing both sequels. Two more adventures in the heart of Maradaine! The sequel to Thorn is THE ALCHEMY OF CHAOS. A dangerous prankster. A trio of assassins. And a legend to live up to. Next, the sequel to Murder is AN IMPORT OF INTRIGUE. A foreign merchant-prince murdered. A neighborhood full of suspects. A few city blocks threatening to erupt into world war unless the constabulary solves the case. 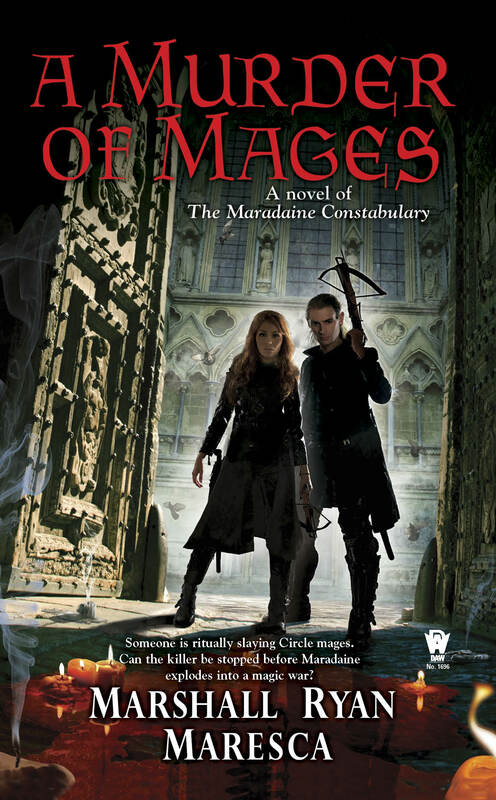 As of right now, I don't have exact release dates, but I anticipate The Alchemy of Chaoscoming out in spring 2016, and An Import of Intrigue in late summer or early fall.